Croplands Equipment offers a range of self-propelled sprayers and boomsprayers for diverse agricultural as well as horticultural applications. 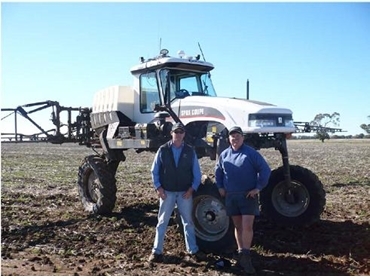 Gilgandra farmer and spraying contractor Craig Barden traded a Croplands Stallion boomsprayer with a 3000L tank and 21m boom for the new Croplands Spra Coupe 4660 sprayer, a self-propelled model featuring a 1514L capacity poly tank and a 24m boom. Mr Barden made the move because he wanted the ability to easily change row spacings in irrigated crops. A feature of the Spra Coupe 4660 sprayers is adjustable on-the-go row spacing from two metres to 2.7m. An optional extension kit is available to allow for spacing as wide as 3m. With a 13,000L nurse tank on the back of a truck, which comes to the sprayer, Craig has no problems staying out in the paddock longer to average around 60ha an hour including fills. Croplands has paid particular focus on soundproofing the cabin and providing an air-ride seat with air adjustable height control, fore and aft isolator, fore and aft adjustment, mechanical lumbar adjustment as well as adjustable armrests. The boom can be dropped as low as 53.3cm in the lowest setting and raised as high as 233.7cm above the ground in the highest setting. Other features in the Spra Coupe 4660 sprayers include the Perkins Tier Three 92kW 125hp engine linked to an Allison 2100 RDS five-speed automatic transmission, a 175L fuel tank sufficient to last a full shift without re-filling and excellent turning radius.